Three members of the Lincoln School of Computer Science, and the DCAPI group, have attended the Vision & Language (V&L) Network workshop, 13-14th Dec. 2012 in Sheffield, UK. 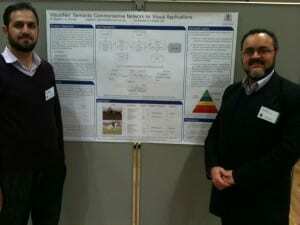 Amjad Altadmri and Amr Ahmed around their poster at the Vision & Language Net workshop, 13-14th Dec 2012, Sheffield, UK. 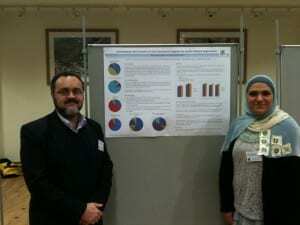 Deema AbdalHafeth and Amr Ahmed at the Vision & Language Net workshop, 13-14th Dec 2012, Sheffield, UK. The event included tutorial sessions (Vision for language people, and language for vision people). We had an increased presence this year. Last year, we had a good presence in the last year’s workshop (http://amrahmed.blogs.lincoln.ac.uk/2011/09/19/vl-network-workshop-brighton/), had good discussions and useful feedback on the presented work. Looking forward for similar, if not even better, experience this year. Best wishes for the presentations. Clinical reports includes valuable medical-related information in free-form text which can be extremely useful in aiding/providing better patient care. Text analysis techniques have demonstrated the potential to unlock such information from text. I2b2* designed a smoking challenge requiring the automatic classification of patients in relation to smoking status, based on clinical reports (Uzuner Ö et al,2008) . This was motivated by the benefits that such classification and similar extractions can be useful in further studies/research, e.g. asthma studies. Our aim is to investigate the potential of achieving similar results by analysing the increasing and widely available/accessible online user-generated contents (UGC), e.g. forums. This is motivated by the fact that clinical reports are not widely available and has a long and rigorous process to approve any access. We also aimed at investigating appropriate compact feature sets that facilitate further level of studies; e.g. Psycholinguistics, as explained later. •Data collected, systematically and with set criteria, from web forums. 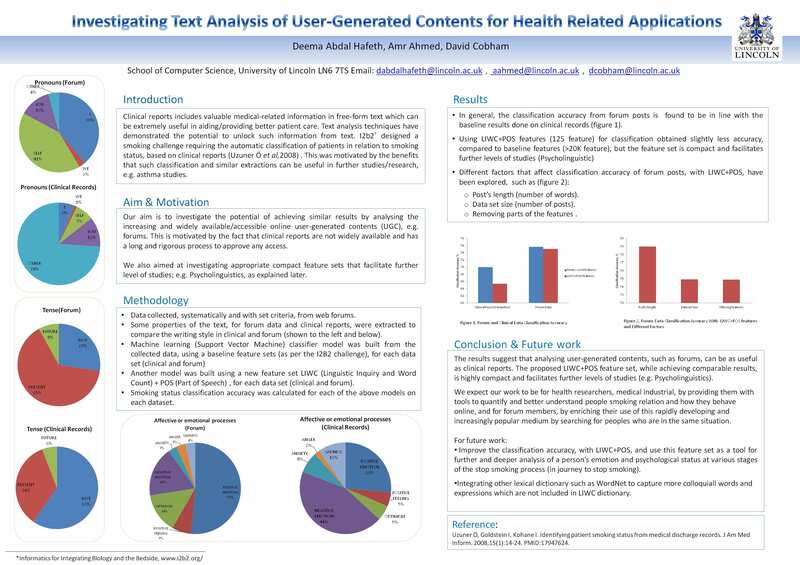 •Some properties of the text, for forum data and clinical reports, were extracted to compare the writing style in clinical and forum (shown to the left and below). •Another model was built using a new feature set LIWC (Linguistic Inquiry and Word Count) + POS (Part of Speech) , for each data set (clinical and forum). •Smoking status classification accuracy was calculated for each of the above models on each dataset. •In general, the classification accuracy from forum posts is found to be in line with the baseline results done on clinical records (figure 1). o Post’s length (number of words). o Data set size (number of posts). o Removing parts of the features . 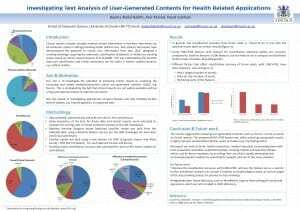 The results suggest that analysing user-generated contents, such as forums, can be as useful as clinical reports. The proposed LIWC+POS feature set, while achieving comparable results, is highly compact and facilitates further levels of studies (e.g. Psycholinguistics). We expect our work to be for health researchers, medical industrial, by providing them with tools to quantify and better understand people smoking relation and how they behave online, and for forum members, by enriching their use of this rapidly developing and increasingly popular medium by searching for peoples who are in the same situation. • Improve the classification accuracy, with LIWC+POS, and use this feature set as a tool for further and deeper analysis of a person’s emotion and psychological status at various stages of the stop smoking process (in journey to stop smoking). •Integrating other lexical dictionary such as WordNet to capture more colloquiall words and expressions which are not included in LIWC dictionary. Uzuner Ö, Goldstein I, Kohane I. Identifying patient smoking status from medical discharge records. J Am Med Inform. 2008;15(1):14-24. PMID:17947624. We just had 2 posters and oral presentations accepted for the coming Vision & Language (V&L) Network workshop, 13-14th Dec. 2012 in Sheffield, UK. This is a good representation from Lincoln (and from the DCAPI group). We had a good presence in the last year’s workshop (http://amrahmed.blogs.lincoln.ac.uk/2011/09/19/vl-network-workshop-brighton/), had good discussions and useful feedback on the presented work.